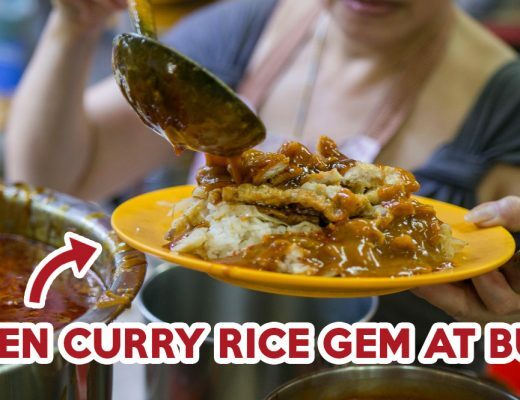 Bobby’s Delicacy is a humble hawker stall serving affordable and value-for-money Western food. 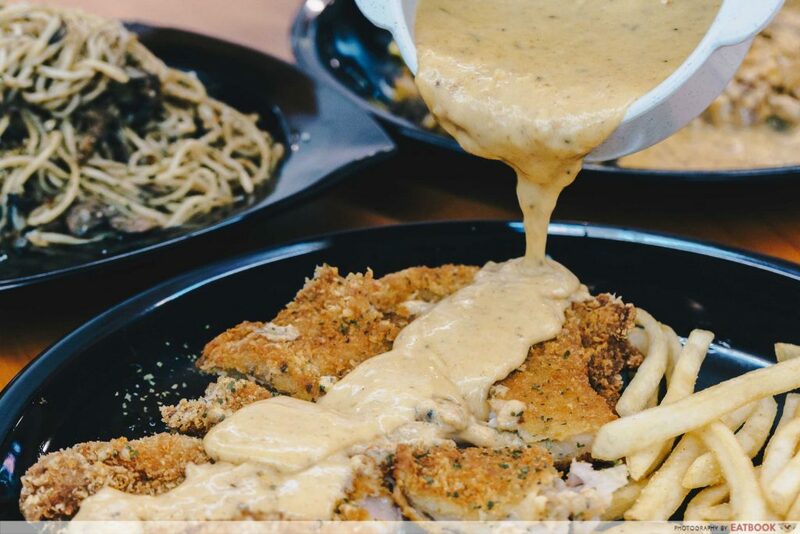 They currently have two outlets, the first one in Woodlands, and this Tampines outlet is their second. 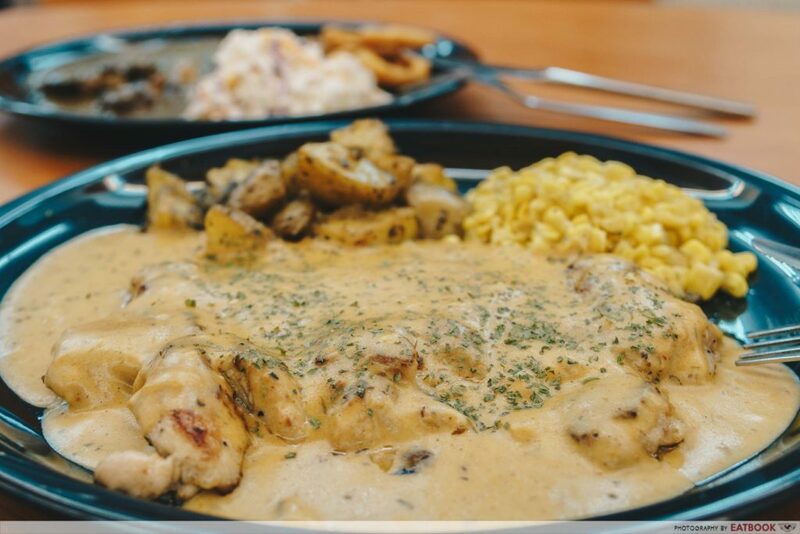 What’s special about Bobby’s Delicacy is the sauces, such as spicy cream cheese sauce, which you can drench over your meats. 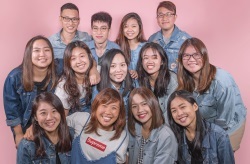 Bobby, the owner of Bobby’s Delicacy, chased his dream of opening up his own Western hawker stall with the support of his family. He started off as a part-timer in a Chinese seafood kitchen when he was younger. His later experience in hotels, including Raffles Hotel and Swissôtel, led him to meet chefs who sparked his interest in Western cuisine. Every main course is served with a sauce and two sides of your choice. 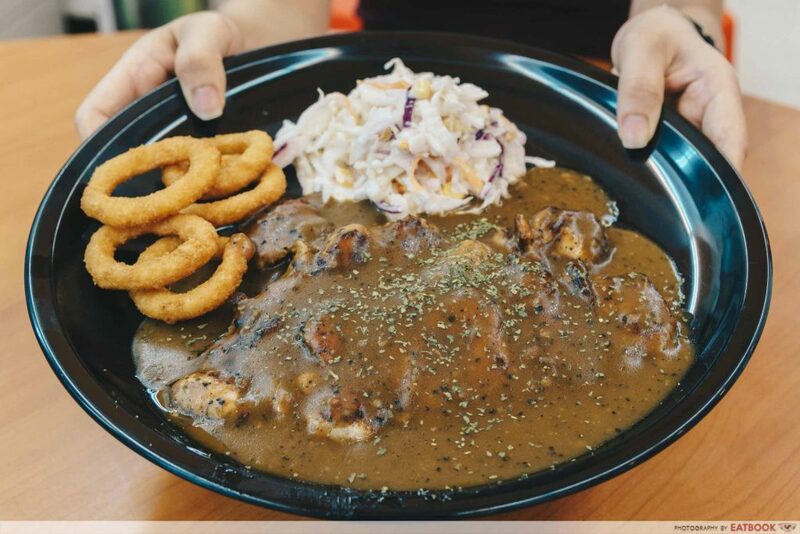 Hearing that the most popular order is their grilled chicken, I went for their Grilled Chicken Chop ($6.90). I chose black pepper sauce to go along my chicken, along with onion rings and coleslaw. The chicken was grilled nicely, each having an even sear and a smokey fragrance. When the dish was served, there was a generous portion of black pepper sauce on top of the juicy meat. Though the black pepper sauce was not the best I have ever tasted, there was a strong peppery kick that lingered in my mouth, and the sauce itself was rich with a smooth consistency. For my next chicken chop, I ordered the stall’s new spicy cheese sauce as well as a side of corn and baked potatoes. The spicy sauce was punchy and creamy, complementing the chicken well. The herbs sprinkled on top seemed insignificant but added freshness to the otherwise heavy dish. Bobby’s Crispy Chicken Cutlet ($7) was my personal favourite. 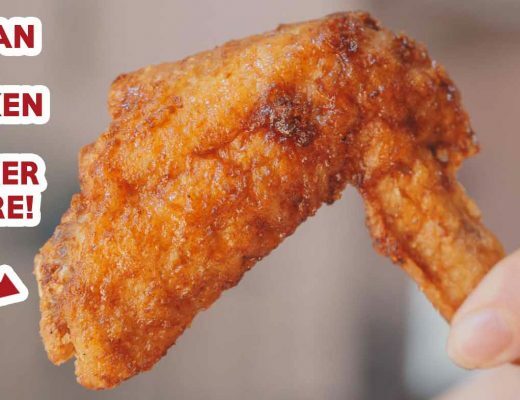 The chicken cutlet had a crispy skin but still remained tender in the middle. A small tub of spicy cheese sauce was served alongside. I recommend pouring the cheese sauce over the chicken cutlet. 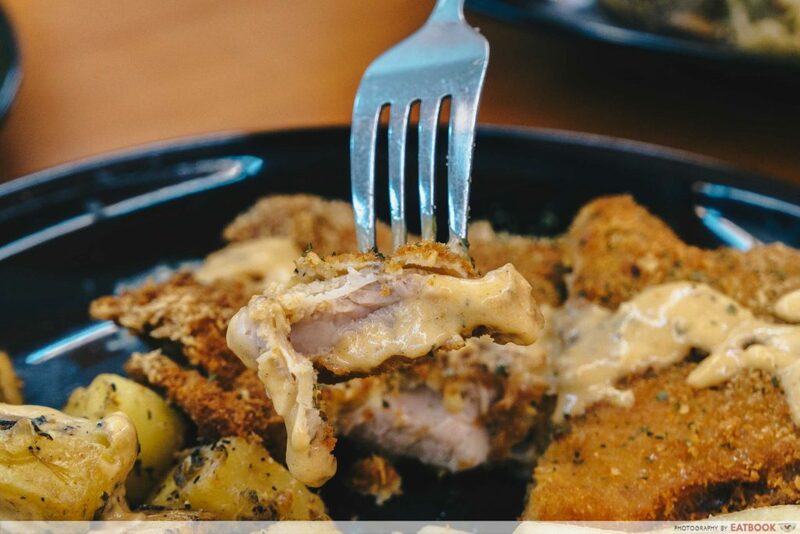 The hot cheese sauce complemented the crispy chicken by adding flavour and a creamy texture to the otherwise dry dish. The sauce made a good dip to the sides as well. The meat inside was even more juicy than the grilled chicken, and tasted good when paired with the spicy cheese sauce. The sides were decent but forgettable. If you prefer rice, Bobby’s Delicacy also offers the option of a rice set where the two sides are replaced with a serving of rice instead. 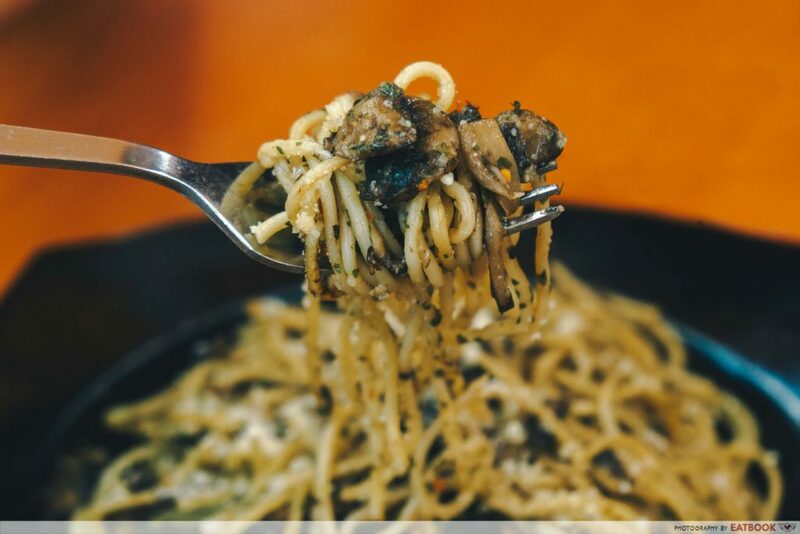 For vegetarians or those looking for a meat-free option, get the Wild Mushroom Aglio Oglio Pasta ($6.50). The pasta was al dente, and a dash of Parmesan cheese sprinkled on top balanced out the flavours well. It is a decent and affordable option, but tasted rather flat. I soon forgot I even had this dish after I left. 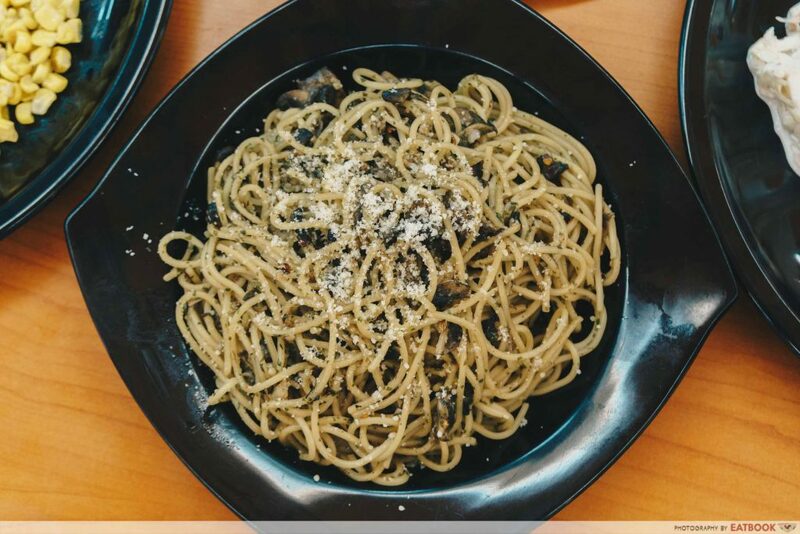 If you are one of those who need meat in every meal, there are other pastas such as Peppery Chicken Aglio Oglio Pasta ($6.50) and Creamy Ham and Mushroom Carbonara Pasta ($6.90). 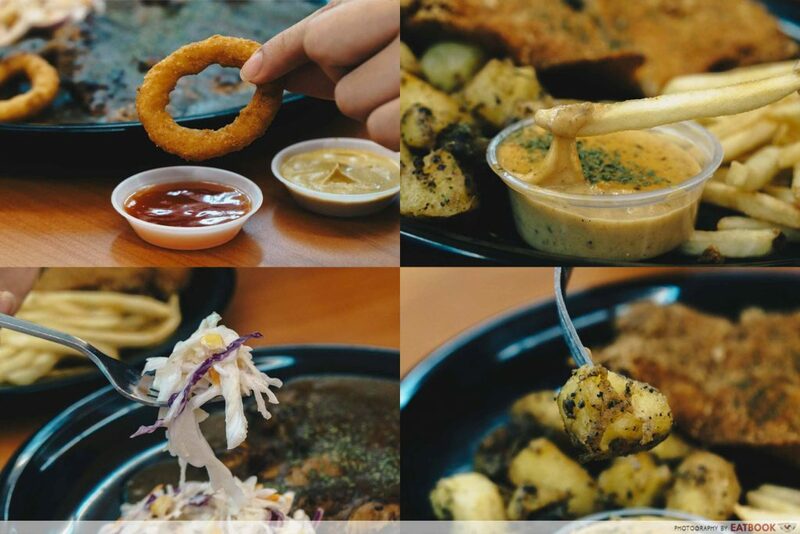 Bobby’s Delicacy is situated in an unassuming coffee shop in Tampines. It is within walking distance from Tampines West MRT Station. 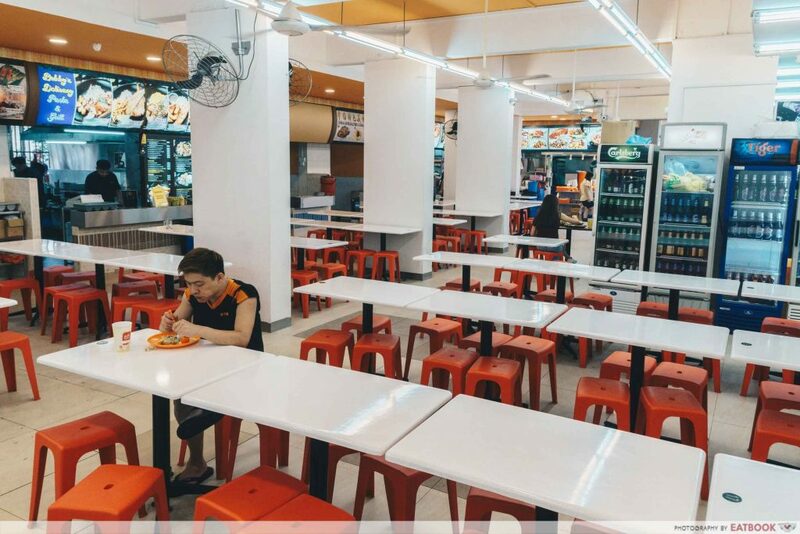 The kopitiam was clean and brightly lit. Even though it is not air-conditioned, it was not stuffy and there were enough fans around to keep me from perspiring. 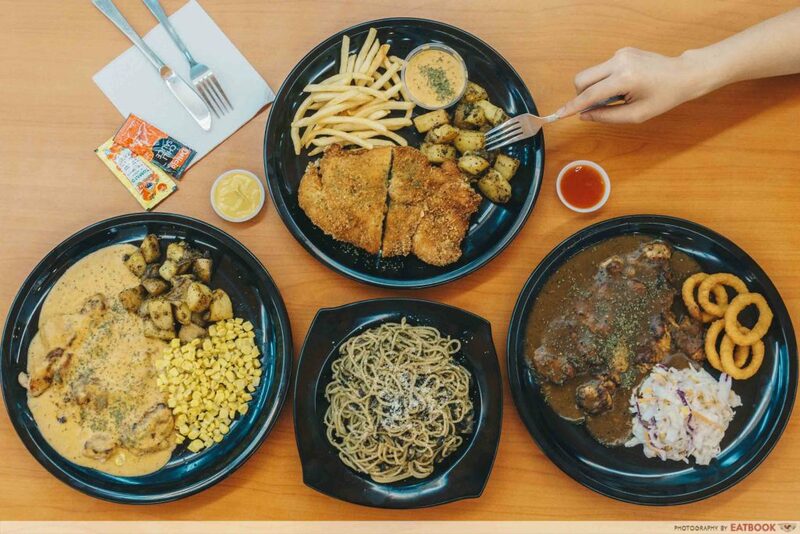 Bobby’s Delicacy offers wallet-friendly Western food – including a wide selection of grilled and fried meats, burgers and pasta. 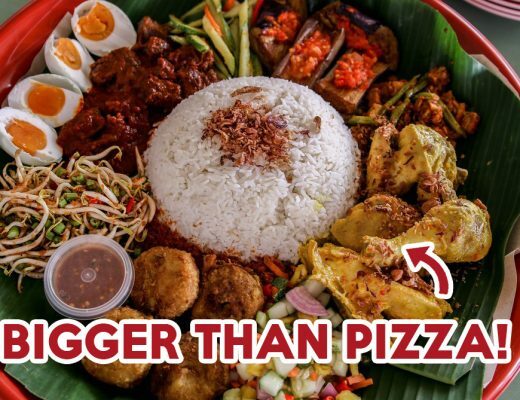 One thing you don’t need to worry about here is not having enough sauce in your dish. Their sauces are not the most unique, but boast rich and complex flavours. I had a pleasant experience here, though I would not head to Tampines specifically to have a meal here. 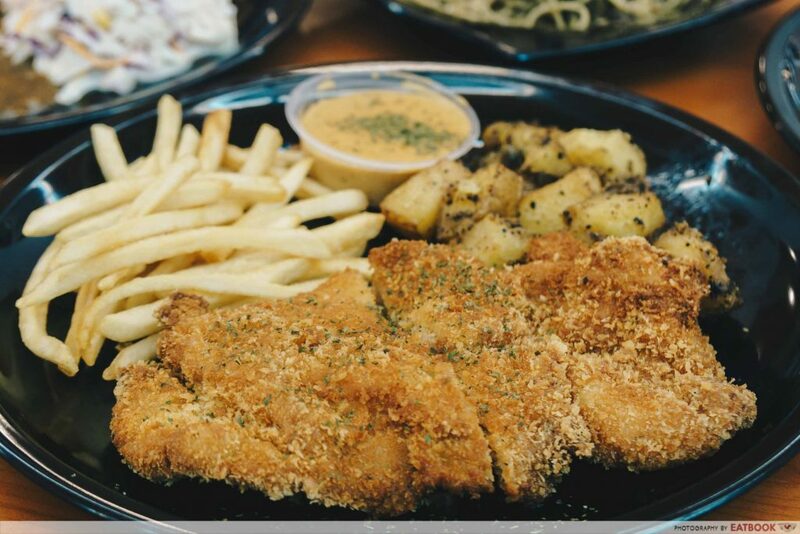 For those staying around the area, you will be pleased to know that Bobby’s Delicacy opens until 11pm every day, so you know where to fix your late night hunger pangs. 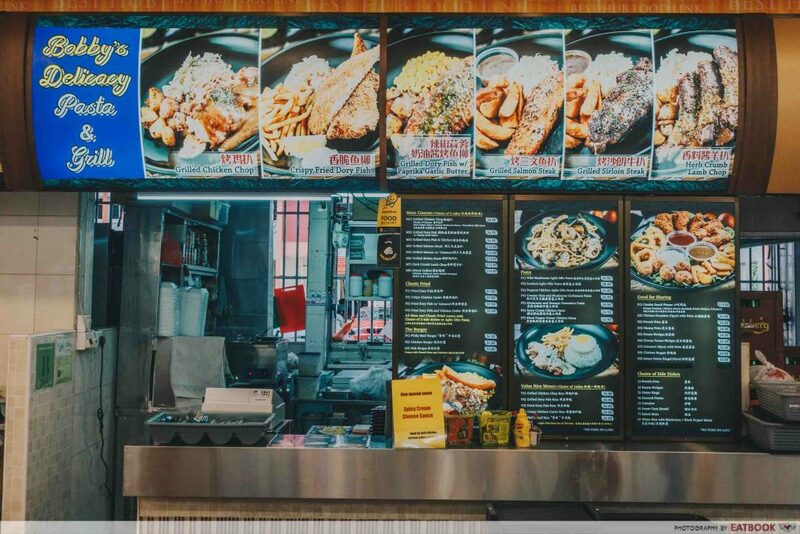 Check out our list of other Western food stalls that offer cheap and affordable Western fare. Bobby’s Delicacy is not halal-certified.